This article was originally published by First American and has been reprinted with permission. Last month, we noted in our latest Real House Price Index (RHPI) report that house price appreciation may be slowing. According to our RHPI, 21 cities experienced a monthly decline in their real, consumer house-buying power-adjusted price level. One reason for the price appreciation slowdown is that 21 of the 50 largest cities in the U.S. experienced an increase in the number of houses on the market in July compared with a year ago, according to realtor.com data. 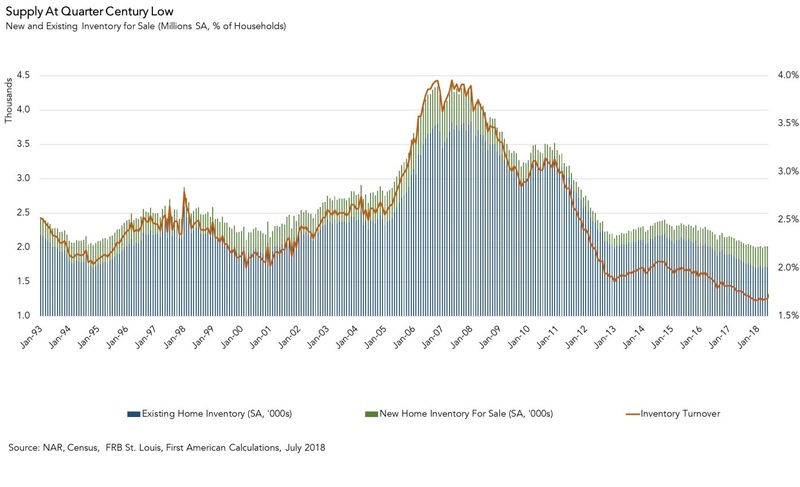 Inventory appears to have increased modestly since December 2017, which marked the 25-year low-point. Last December, inventory turnover (the total supply of homes for sale nationwide as a percentage of occupied residential inventory) was 1.66 percent. In other words, only 166 homes in every 10,000 were for sale, which is well below the historical average of about 250 in every 10,000. In July 2018, the inventory turnover rate increased to 1.74 percent. While still very low, it’s the first time we’ve reached this level since July 2017, and it represents an ever-so-slight improvement from December’s 25-year low point. Local real estate trends support this overarching national trend, since it appears that the supply shortage is primarily easing in more expensive cities. The five cities that saw the largest annual increase in active listings were: Denver (+87.0 percent), Columbus, Ohio (+59.3 percent), San Jose, California (+47.6 percent), Seattle, Washington (+27.6 percent), and Washington, D.C. (+24.0 percent) — some of the most expensive cities in the country. House prices are in part a reflection of supply and demand. As housing supply increases relative to demand, price appreciation slows down. In addition, rising prices and modestly increasing mortgage rates have reduced affordability, particularly for the first-time buyer struggling to find something to buy with so little for sale. Some homebuyers, specifically first-time millennial home buyers, are getting discouraged and may be temporarily “boycotting” the market. Just as increased supply reduces price appreciation, so does reduced demand. Mark Fleming, Ph.D. is the chief economist at First American Financial Corporation in Washington, D.C. You can follow him on Twitter at @mflemingecon or on LinkedIn.